"The coolest fashion trends for teens"
I love this sweater!!! 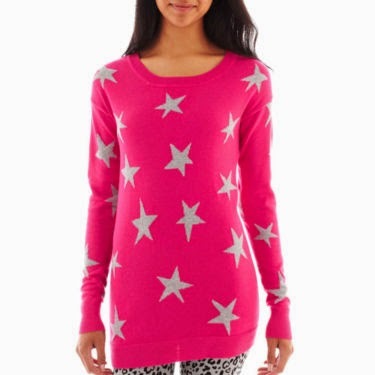 The Arizona Sweater Tunic is on sale now for $19.99 at JCPenney. When I wore the sweater, it was warm, comfortable and stylish. This Sweater Tunic goes well with a cute skirt and leggings. It is also perfect with a pair of dark denim or white jeans. I really like Arizona Jean Company products!!! WARNING! This blog is monitored. Content is intended for kid’s fashion, fashion news, events and activities. Do not post any adult content, vulgarities, or anything that could be construed as inappropriate for children. Violators of this policy will be promptly reported and prosecuted to the fullest extent of the law. This includes local and state law and other proper authorities.